Eurodragster.com's longest-standing sponsor ICE Automotive has been building V8 racing engines for over twenty years and at Silverstone Grand Prix Circuit for the last three. With championship successes across the spectrum in the normally-aspirated drag racing world, winners with ICE include Tim Cook, Dave Mingay, Tony Rose, Peter Wacker, Steve 'Splinter' Nash, Ian Jackson, Steve Pateman, Danny Cockerill, Graham Ellis, Tim Garlick, Tim Adam, Pete Creswell, Steve Green, Talbot Racing and many others. Small blocks and big blocks, Chevy, Ford and Mopar, are all built and dyno'd in-house to produce consistent and reliable horsepower. The business has now expanded into chassis building in order to offer customers a one-stop shop for all their racing requirements. 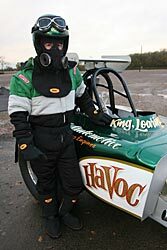 Havoc is the first car built by the chassis shop and was put together by Nick Davies, Rob Loaring, Nigel King and Steve Green. 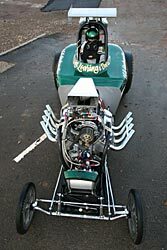 Eurodragster.com spoke to Nick Davies of ICE Automotive in December 2005 to get the lowdown on the classically-styled altered which is already being regarded as one of the best-looking race cars in Europe. Eurodragster.com: How long have Rob Loaring and yourself been planning this car? Nick Davies: Havoc has been in the planning stage since we retired the Oldsmobile Cutlass from Pro Mod racing at the end of the 2000 season. Initially, we were planning a replica of the famous Tee Rat Fuel Altered but an inability to commit to a rule book left us in a position where we decided to build a nostalgia-style alcohol race car - Havoc is the result. Eurodragster.com: How long has the car taken to build, and who built what? Nick Davies: Too long! Customer commitments have meant that the car has taken longer to build than it should have done. That, together with the perennial racer's problem of allocating inadequate funds to too many areas has meant the début was a little delayed. The car has been built entirely in-house at Silverstone. The expansive team of builders comprises Rob, Nigel King, Steve Green and myself. All fabrication and chassis work as well as the engine and drivetrain has been built within the workshop only farming out plating and painting to third parties. Eurodragster.com: Were there any major changes to the project as it went on? Nick Davies: None, thankfully. It is precisely as we had envisaged at the outset. Our aim was a modern interpretation of a 1970 AA/A altered. We hope we've pretty much got it. Eurodragster.com: What's that wheelbase? It looks very short! Eurodragster.com: What is the body and where did it come from? Nick Davies: 1932 Austin Bantam. We sourced a full-fendered replica body in the USA, dummied up the wheels and drivetrain and started cutting! It now looks very different from where we started but it retains the character of the Bantam and the theme of the era. 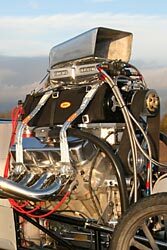 Eurodragster.com: Tell us about the powerplant. Nick Davies: It is a 526 ci Rodeck Chevrolet with Pro Stock heads, our own intake manifold and a 14-71 hi-helix supercharger topped with an Enderle barn door injector. We started building it as an engine to sell into the pro mod world before the hemis became in vogue. Rob and I have extensive cstomer commitments both at and away from the track,so we have built it as a low maintenance deal which, once we have baselined the thing, we don't anticipate changing bearings and rods on any more frequent a basis than most of the other engines we build for customers. The car only weighs 1750 lb so we knew we wouldn't need 2000 hp to run it into the sixes so we've backed the whole thing down for the moment. We wanted to have fun with it rather than have to work on fixing it all the time. Eurodragster.com: Tell us something about those front wheels - the style looks familiar to longtime fans. Nick Davies: The front wheels were a really lucky find for us. We had been on the search for a pair of original magnesium American Racing twelve-spokes for a while. Most of the wheels we found were either 15" or 18" diameter and couldn't get the right looking tyres for them. A friend of mine in the U.S. called me one day and said he'd found some mint 17" wheels that had been stored for nearly thirty years but that they would not be cheap. They weren't cheap, but in comparison to what we've seen since, they could have been much worse. They make the look of the car too. We would desperately like to buy another pair if anyone knows of the whereabouts of any more. Please let us know - you never know when a concrete barrier is going to be a tad too close! Eurodragster.com: Who did the painting and signwriting? Nick Davies: Big thanks to two very good friends of ours. Firstly to Jon Hogarth and all at Specialist In Design in deepest Norfolk. SID did much of the prep work on the body and painted the pearl, metalflake and lacquer. Secondly to Neil Melliard of Prosign (who else?) for the signwriting. Prosign interpreted our loose designs and transferred them into goldleaf in a period-perfect style. Both of these guys have helped turn our vision into reality. Eurodragster.com: In which classes will you be running and what is your 2006 schedule? Nick Davies: The car has been built to have fun and to race. Funds, weather and other commitments permitting, we will run it at every opportunity. Someone said that the first RWYB is at the end of January, right? Being as it is running methanol, it is legal to compete in various classes including NFAA and Super Pro ET. Assuming there was sufficient interest, we will also consider any match-race opportunities. 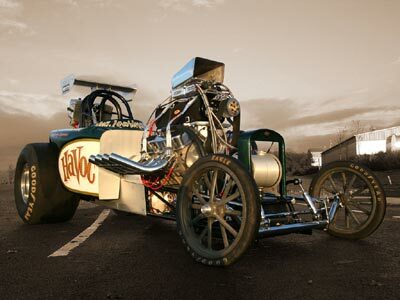 Havoc will make its show début at the Xtreme Wheels show at Alexandra Palace at the end of February. Eurodragster.com: What kind of performance are you expecting from the Altered? Nick Davies: The engine has been built to make horsepower adequate to get us comfortably into the sixes. We haven't raced anything quite like this for a while so the car itself will dictate how fast we go and how quickly we get there. No promises. Eurodragster.com: You've driven a Pro Mod into the 6.6s at over 210 mph, do you think that will have been good preparation or do you think you'll be starting from scratch with this car? Nick Davies: Anything that runs over 200 mph must give some useful experiences. The car is very different from the Cutlass which I found a very comfortable environment from which to race. I initially thought that the centre-seating position and the somewhat obscured forward view, together with the very different controls and safety equipment would be somewhat intimidating. Being strapped in and running the car for the first time, I was very pleasantly surprised as to how comfortable and confidence-inspiring it felt. I'm sure much is to do with the fact that the car has been built around me in the first place. It may be a different story once we get out on the track, but I can report that rolling burnouts in the car park at Silverstone were a blast! Eurodragster.com: Do you still intend to run Fuel in the future? Nick Davies: Absolutely. Both Rob and my first real introduction to British drag racing was the seventies, Nigel the decade before, a good time for Fuel drag racing. We have all been big fans since and this was one of the primary drivers behind the original Tee Rat plans. Both modern Top Fuel and Fuel Funny Car racing is too cost-prohibitive for us but the resurgence in popularity of the nostalgia scene in the U.S. has given us ideas as to how we can fulfill the dreams of building and running fuel cars to a closer-controlled budget. It doesn't really make much sense to switch Havoc over to fuel as we don't believe that horsepower will be a limiting factor in the performance of the altered - there are a multitude of things that we can do with fuelling or boost if we need any extra! We have sufficient engine parts to run Havoc hard for a couple of years, after which we will retire it. At that point, we hope to be well on the way to constructing a new car. On fuel. To a budget. To a stable rulebook. Eurodragster.com: Is the Tee Rat replica project history? Nick Davies: At the moment, sadly it is. We can see little point in building a 112" wheelbase altered with an iron 427ci Chevy and a 6-71 blower on Fuel whilst there is a class allowing much longer, much more powerful engined altereds. It just wouldn't be competitive and we like to win. Havoc is, actually, what was going to be Tee Rat. The crankshaft centreline and other basic layout is identical. We took too long to build it and having been so deeply involved with the advent of Super Modified, missed the opportunity to put together an appropriate rule book. We have toyed with the idea of converting Havoc into Tee Rat in a couple of years' time but can't make everything add up right now. We would like to thank everyone who has supported us in the plans for Tee Rat, particularly the Stone family. Never say "Never", eh? Eurodragster.com: Is there anyone you would like to thank? Nick Davies: Other than the people mentioned above, big thanks to our sponsors Allstar Performance. Eurodragster.com: If anyone looks at Havoc and thinks "I'd like these people to build me a race car" then what should they do? Nick Davies: The chassis shop is now fully up and running with Steve Green full time in the workshop. We are equipped to deal with the large and small projects in tandem with the ongoing engine-building and parts supply functions. Your truly one-stop race car shop. Call on 01327 858992 to discuss your requirements. Our web site can be found at www.iceautomotive.co.uk. Eurodragster.com: Thanks for your time Nick, and good luck with the altered. We can't wait to see it running! We took a large number of photographs of Havoc, which you can view by clicking here.